There’s nothing like a live concert in an outdoor arena, and the Ak-Chin Pavilion is among the best that there are. It seats up to 20,000 fans at a time, with 40-foot screens allowing those in the back to see their favorite musicians up close. Nine Inch Nails, Toby Keith, Sting, KISS, Kings of Leon and Lil Wayne have all performed here, and metal bands touring with the Mayhem Festival perform at the arena every year. If you want to do your Phoenix stay in style, there’s nothing quite like the Arizona Biltmore—Marilyn Monroe, Irving Berlin and George W. Bush agree. A luxury resort that’s part of the Waldorf Astoria collection, the hotel offers not only opulent guest rooms and suites, but also features sprawling grounds containing gardens, swimming pools, an award-winning spa and a striking architectural style. This shopping center (and office complex) is home to a 24-screen AMC movie theater and a dozen different coffeeshops and restaurants—whether you’re feeling Starbucks or want to try the locally-owned Canyon Café, looking for an upscale dinner at 1130 The Restaurant or a quick bite at Subway, it’s all here. And every restaurant features outdoor seating, so you can people-watch and enjoy the fresh air. Guns and target shooting are an important part of Southwestern culture, but safety should always be of the utmost importance. So why not give it a shot at the nation’s largest shooting range? The main rifle range has a total of 67 points, and there are a number of specialty ranges as well, plus accommodations for archery and clay target shooting. The facility also offers gun safety classes, and there’s a adjacent campground for when you want to make a weekend of it. With two main stages and a black box, the Herberger offers dozens of shows each year by two resident companies, a children’s theatre group, and both local and touring troupes. There’s classic musicals, new drama and comedy, modern dance, an art gallery and Lunch Time Theatre—a one-act play series that performs weekday matinees for cutting-edge half-hour shows in the middle of the day. This is where Phoenix started—the only houses still standing from the original town are all found on the same block. The turn-of-the-century homes have all been adapted for new purposes, which means that when you’re done admiring the architecture from the outside you can step inside the Rossom House Museum and see what life was like for the wealthy of Phoenix a hundred years ago, try the Japanese fare served by Nobuo at the Teeter House or a hot beverage at the Royal Coffee Bar in what was once the Teeter family’s mule barn, knock a few back at the Silva House ( The Rose & Crown British pub today), or enter the old Baird Machine Shop/Pizzeria Bianco for some of the best pizza you’ll ever taste. Broadway musicals, opera, jazz concerts and stand-up comedy all take their place on the stage at the Orpheum, but half the show is the theater itself. The lobby and mezzanine are adorned in the ornate style of Spanish and Italian palaces, while the gold-bedecked auditorium itself is wrapped in a mural of a rocky landscape that climbs up the arched ceiling to become the evening sky. The other place in town for the operatic arts—the company here is the Arizona Opera, while over at the Orpheum it’s the Phoenix Opera. 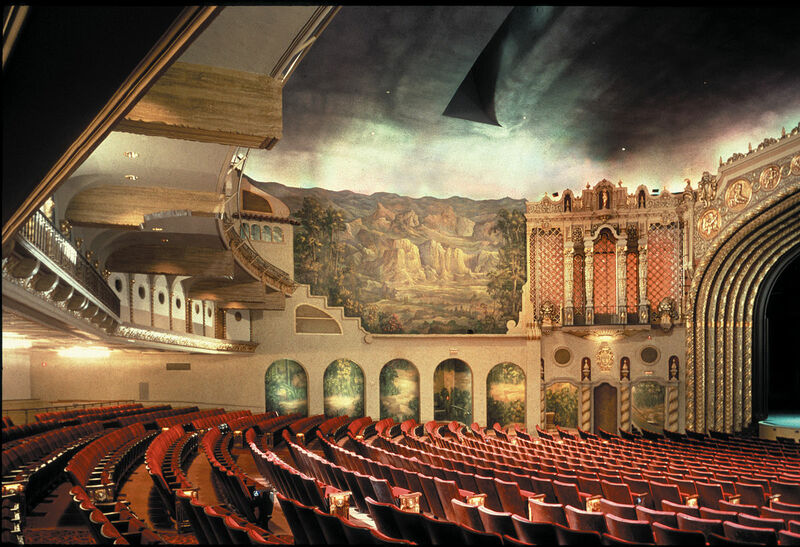 As the name suggests, it’s also home to the Phoenix Symphony. Ballet Arizona is based here too, and it’s a great place to see many touring performances by musical troupes, dance companies and various entertainers. Spacious and contemporary describe the look of the auditorium and lobby alike, with chandeliers and tapestries that bring together the art of Venice, Italy and that of the Navajo. First off, it’s really big—the arena fills a million square feet, and two million people come here every year to see their favorite athletes and performers. The US Airways Center is home to three major sports teams: the Phoenix Suns of the NBA, the women’s basketball team Phoenix Mercury, and Arena Football League champions the Arizona Rattlers. Pop stars like Ariana Grande, The Black Keys and Fleetwood Mac perform here too, as does the Ringling Bros. and Barnum & Bailey circus, Disney on Ice and all sorts of other arena-sized shows. There’s a lot of money in chewing gum. William Wrigley Jr., whose company’s products are still found in every grocery store aisle in the nation, not only bought out the above-listed Arizona Biltmore but then built this mansion nearby, a 50th wedding anniversary gift for his wife. Today it’s a private club (with public tours) most notable for Geordie’s Restaurant and Lounge, which boasts an award-winning wine list offering 500+ varieties. But that’s only a third of it! If you’re looking for a getaway, the Phoenix Points of Pride offers plenty in the great outdoors—and if you’re after more arts and culture, there’s several museums worth visiting.